In the wake of the presidential election results, the trend already underway of retirees going overseas for better-value living, more affordable healthcare, and warmer weather appears to be poised to accelerate. Already the Social Security Administration sends 660,528 payments overseas… and anecdotally, according to the editors of International Living, the number of U.S. retirees receiving Social Security benefits abroad is likely higher than that, as many simply continue to bank in the States while living outside the country. While Canada seems to top the list of target destinations for many potential escapees—in fact, that nation’s immigration website reportedly crashed on election night—the editors at International Living recommend havens where the climate is milder and the cost of living lower. As many as a million U.S. and Canadian citizens already call Mexico their home, with more joining them all the time. In terms of numbers, Mexico is the most popular expat destination for North Americans in the world. This should come as no surprise—Mexico has a lot to recommend it. Stately Spanish colonial cities in Mexico are steeped in tradition, and soaring baroque church spires overlook gracious squares. Here you can dine in elegant cafés, and browse upscale shops on the very spots where the heroes of the Revolution declared independence from Spain and forged a new country. For all these reasons, and many more, Mexico is one of the world’s top destinations for those dreaming of a relaxed and romantic new life abroad. America’s closest southern neighbor consistently makes International Living’s list of the best countries to live in. Many expats choose to live in Mexico’s Colonial Highlands. 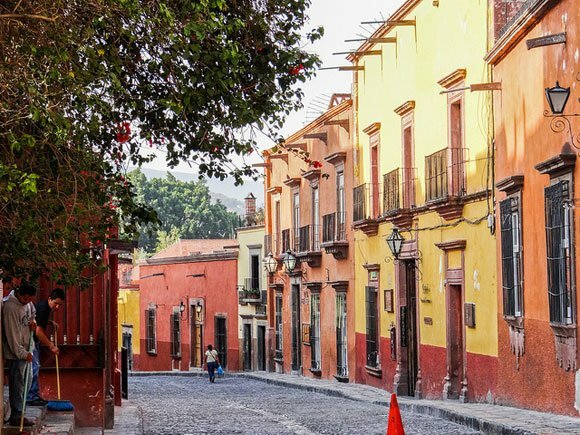 Three popular towns in the region are San Miguel de Allende, Querétaro, and Guanajuato. Each have a colonial centro histórico—UNESCO World Heritage sites—where grand colonial homes have been converted to hip restaurants, chic boutiques, hotels…or sometimes just tiny mom-and-pop corner stores or simple eateries where you can get a meal for a couple of dollars. And, of course, many of the colonials have also been renovated to become homes. In San Miguel de Allende you’ll enjoy a comfortable climate, rich cultural life, charming historic architecture, and low costs. Guanajuato and Santiago de Querétaro (usually called simply Querétaro) are off the radar but quite livable. Mexico is a big country, with colonial villages and towns all over. But this trio is clustered three to four hours by car or bus northwest of Mexico City, and you can travel from one to the other easily in about an hour ($5 to $7 for a first-class bus ticket). Money-wise, it’s a great time to be anywhere in Mexico—the exchange rate today is 20.07 pesos to $1. Combine that with already low costs for real estate, food, restaurants, entertainment, and transportation, and you have the spending power to live very well on around $1,800 a month for a retired couple. After rewarding but long careers in the U.S., Chris and Rex McCaskill moved to San Miguel de Allende four years ago. You’ll find the tropics along the Pacific and Caribbean Coasts, while most of the Central Valley is cool and breezy. If you find it difficult to choose which climate you prefer, you will be glad to know that the mild temperatures of the Central Valley are just two hours by car from the tropical beaches of the Pacific Coast. Expats are attracted to Costa Rica for numerous reasons, which include the low cost of living, excellent healthcare, modern telecommunications structure, beautiful beaches, rainforests, lush valleys, and cool mountains…not to mention the theaters, art galleries, and fine dining. There are more than 50,000 expats living in Costa Rica and many well-established expat communities. Costa Rica’s lake region of Arenal is a popular expat haven in the country. Not surprising… It’s stunningly beautiful. The weather is near perfect. 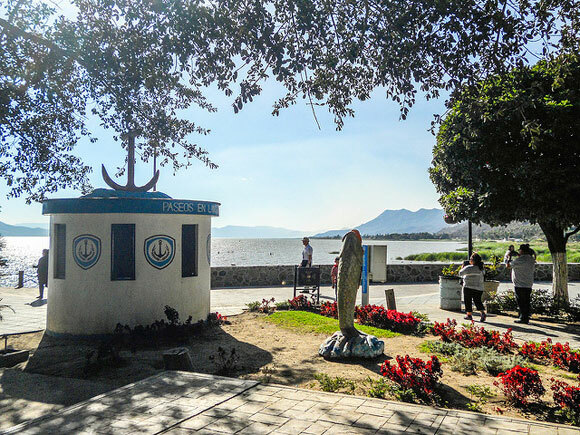 The community of locals and expats is welcoming and friendly. You have a choice of great restaurants to eat in. The lifestyle here is natural and relaxed. Some explore the landscape on horseback. Or go boating, wind-surfing or fishing on the lake. Lynda and her husband Tim, 67, live in a home up the hill from the lakeshore. Their porch, full of hummingbirds, offers a 180-degree view of the lake. A huge picture window in their bedroom (they put the bed facing it) and another by the bathtub means they can see the lake from almost everywhere in the house. Panama offers a very comfortable live overseas solution, in part because the nation is much more developed than most visitors expect. Many are shocked by the modernity of Panama and the clusters of skyscrapers that define Panama City’s skyline. All of the amenities you could wish for are readily available. In Panama, you will enjoy the benefits of a developing economy where you can still take a taxi across town for a buck or two, get your haircut for a couple of dollars, or enjoy dinner for two with a bottle of wine at one of the finest restaurants in Panama City for a mere $40. There are also lots of activities for you to enjoy, from jazz clubs to art openings to English-language theater performances. You may be wondering what you will do when you retire…but in Panama, you will never find yourself bored. Outside the city you will find the true treasures of Panama. There are beautiful beaches everywhere, with the Atlantic Ocean on one side and the Pacific on the other. There are rolling green tropical mountains, fertile farmlands, lush rainforests, and small towns where foreign visitors are made to feel welcome. 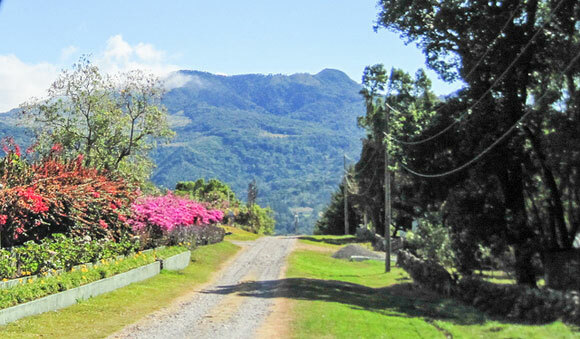 The town of Boquete is a popular expat retreat in the highlands of Panama’s Chiriquí Province. Its lush green hills, flowing rivers, and spectacular waterfalls make it one of the most unspoiled retirement retreats in the world today. Now Nancy, 63, has nothing but good things to say about Boquete. She and her husband Don, 61, moved here from the Kansas City area in 2010 with their two sons. “Our lives are so much better here. We are healthier, we are happy, we have a social life, and we have lots of activities to enjoy. Life is richer and filled with great experiences. I love the Panamanians and their culture,” she says. 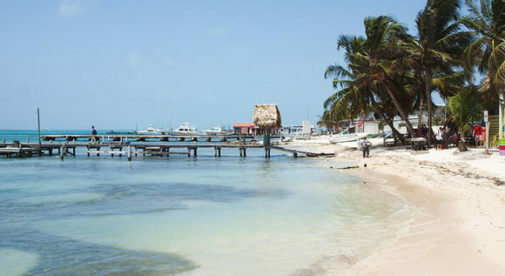 As a Caribbean destination, Belize is quite affordable and the country offers some big advantages—economic stability, a strong retiree program, and a wonderful climate, if you like the tropics. This Central American country has a beautiful coastline, where the sunbathing, swimming, snorkeling and diving, fishing, and sailing are among the best in the world. Moreover, Belize is an English-speaking country. If you feel you are ready to move abroad but don’t want the hassle of having to learn a new language, Belize could be the ideal place for you, and the perfect place to start a business. 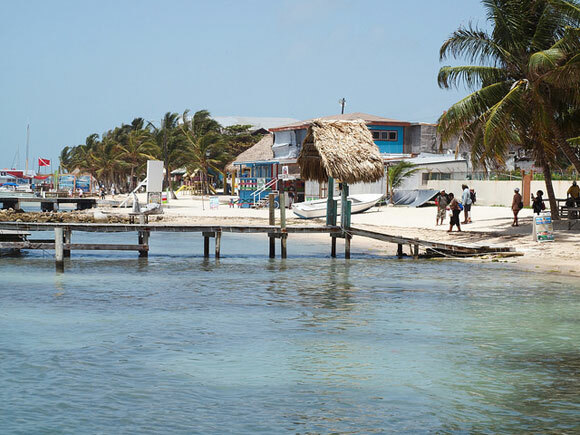 To a growing number of expats weary of regimented, high pressure lifestyles at home, free-wheeling, casual, affordable Belize has proved almost irresistible. Here, you are blissfully free from commuter crush, 24-hour news, and workaday stress. It’s a country where you can explore and develop, and there’s room to breathe, with a pervasive, heady sense that almost anything goes. International Living’s Belize Correspondent, Ann Kuffner, has lived in Belize with her husband Mike for since 2008. They have settled on the Caribbean island of Ambergris Caye. Ambergris Caye is a popular offshore caye that’s located 35 to 40 miles southeast of Corozal. In 2013 and 2014 it was voted the world’s best island by Trip Advisor members. The nearby World Heritage Mesoamerican barrier reef and stunning azure Caribbean waters enchant visitors and expats alike. “Belize first attracted me because of the spectacular Caribbean seascapes and the vibrant offshore barrier reef teaming with colorful, diverse sea life…the laidback lifestyle…affordable cost of living…and the friendly Belizeans,” Ann says. “Belize also has plenty of fresh fruits, vegetables, fish, shellfish, and chicken. Much of the country’s produce, chicken, and cheese come from Mennonite farmers. So the food and produce are fresh, not tainted by the chemicals used at corporate farms in North America. The fish and lobster are freshly caught from the Caribbean Sea. The standard Belizean diet includes plenty of beans and produce such as sweet carrots, zucchini, avocados, sweet potatoes, peppers, squashes, papaya, oranges, grapefruit, limes, bananas, and chaya, all of which are tasty…and healthy. This was International Living editor Jason Holland’s report of Peru after he recently returned from a scouting trip to the country. In Peru, your cost of living will, of course, depend on your lifestyle. But many expats report spending about $1,500 a month, all in. 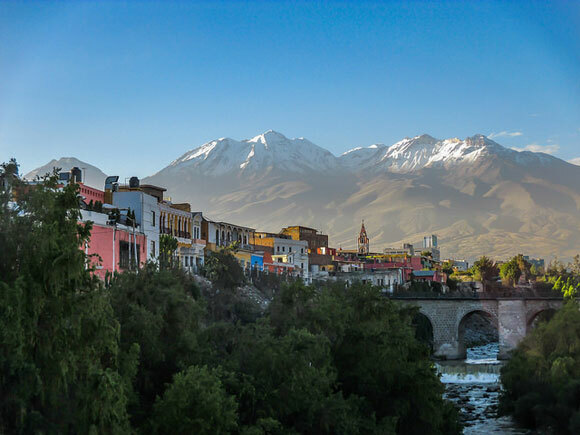 Arequipa and Cusco are two of the most popular towns for expats to live. Arequipa is built around a UNESCO World Heritage site, a district of well-preserved Spanish-colonial homes and churches. It’s known as Peru’s “White City,” as many of the old buildings are built from sillar, the white volcanic rock quarried in the nearby mountains. Here you can enjoy a low cost of living, stunning scenery and 300 days of sunshine in which to enjoy it. Bill, 65, has been living in Arequipa for about a year. He lives in the Bustamante district, a modern area within 20 minutes’ walk of the historic quarter. He’s also found it very affordable to live here. “Outside of the tourist area, you have very cheap restaurants. I spend about $30 a week on food, mostly going to the market,” says Bill. Cusco, the old capital of the Inca Empire and later a major city of the Spanish colony, is a place that breathes history. The colonial quarter, surrounding the showpiece Plaza de Armas, is full of narrow cobblestone streets, cathedrals and churches, quiet courtyards, and vibrant plazas. It’s a booming city of 500,000 people, with red-brick homes and apartment buildings extending to the edges of the valley and up into the surrounding hills. Despite their both being colonial cities, Cusco has a more homelike and historic feel than Arequipa. Tony Ballantine, 58, has been living in Cusco for three years. Originally from Scotland, he’d been living in the U.S. for many years before moving to Peru.